Wondering where I've been the past week? Well, I was visiting my friend Samantha in Boston, and eating my body weight in food everyday. I miss that place a whole heck of a lot and it was really fun to go to my old favorite restaurants and jealously try out wonderful, new places. The weather was suitably crappy. Really windy, mostly cold and then rainy as the week progressed. The sun was out just a couple days. I would say that it made it easier to leave, but when my friend and I came back to Denver to finish the vacation, the weather was nearly identical here! Ugh. Among the wonderful meals at The Abbey, Orinoco, Hungry Mother, Zaftigs, and too many others, the most delicious (as always) was at Toro. It's a Spanish tapas place in the South End that goes far, far beyond the typical. Yes, you can get patatas bravas and tortilla española, and they're wonderful there, but you can also get more unusual dishes. Some of the dishes we got were mollejas (sweetbreads with a blood orange sauce), corizon a la plancha (beef heart), and estufada de tripa (an unexpected southeast asian-inspired tripe stew). We also got an unassuming little dish of coliflor a la plancha. We always get it; it's not super fancy or complicated, but it's so yummy. "A la plancha" means grilled on a metal plate, basically. So you get a nice, crisp outside to whatever you're cooking. I've roasted cauliflower a whole bunch, but this is slightly different. The cauliflower is cut nice and thin so it cooks through faster, allowing you to get that browning, but also to have it be really tender. After my friend came back to Denver, we continued our gluttony, eating at Biker Jim's new brick and mortar outpost, Cherry Cricket (we felt like we had to after watching Man vs. Food), and the stupid hip, but really good Lola. Now that the vacation is over, it's time to go back to normal eating. But I was feeling sad that Samantha and I don't live in the same city and still a bit homesick for Boston, so I thought that I'd recreate something that I ate there. I really wanted to try making the cauliflower dish from Toro (also, I'm not really sure where to get sweetbreads here?). I think I did a pretty good job. I changed it up a bit, but overall it has the same effect. First, I added chorizo to this dish. It makes it a complete meal, rather than just a tapa. I also used grape tomatoes in my recipe, but I'm not going to put it in here. It's just not tomato season yet and they weren't terribly good in this. At Toro, there were toasted pine nuts in the dish, but they were SO expensive at two different stores I checked. $30/pound is ridiculous. I didn't check at Whole Foods, but the last time I bought them there, they were more like $13/pound. Anyway, I just used roasted almonds. I would encourage you to get pine nuts if they're not $30/pound, because they're super good. Just toast them in a dry pan until they're a little browned. 1. 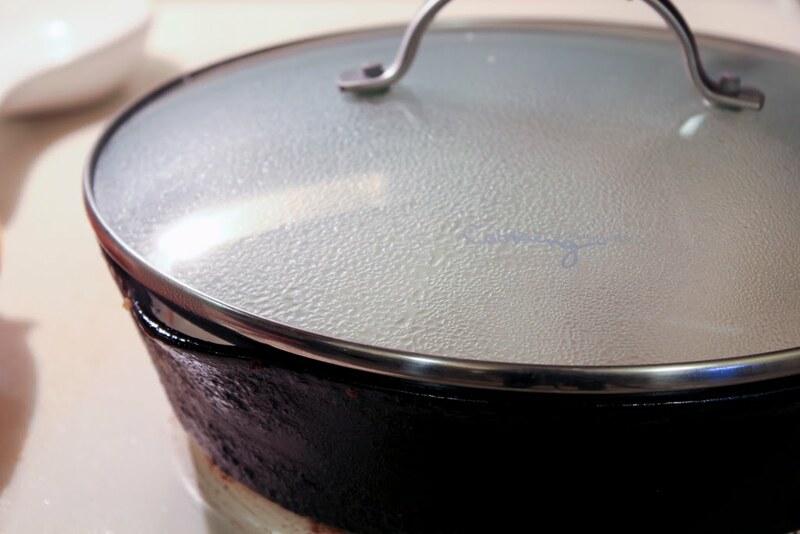 Heat about 1/2 tablespoon olive oil in a large cast iron pan over medium high heat. 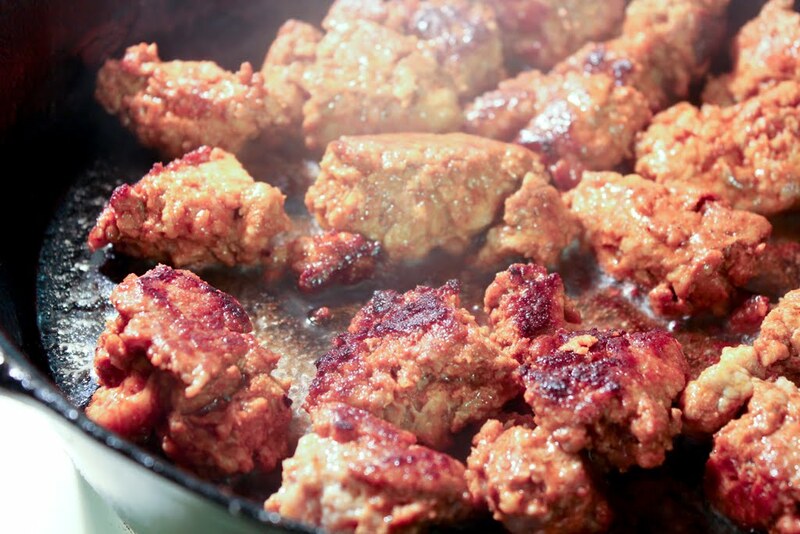 Add chorizo and break up into 1-inch chunks. Cook for about 7 minutes and then flip them over and around to brown the other sides. Cook another 7 minutes. Cut into the biggest chunk to make sure it's cooked through, then scoop out the sausage and add to a bowl. Cover to keep warm. 2. In the oil that's leftover in the pan, add the cauliflower, raisins, pimentón de la vera, and some salt. You may have to do this in two batches. You want about a single layer of cauliflower and don't want to crowd the pan. 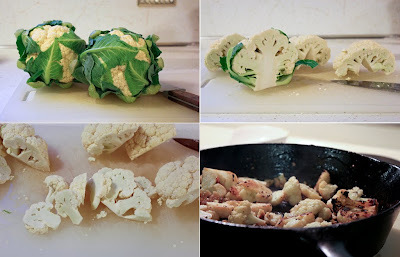 Cook cauliflower, covered, for about 10 minutes. Halfway through, flip it to brown the other side. 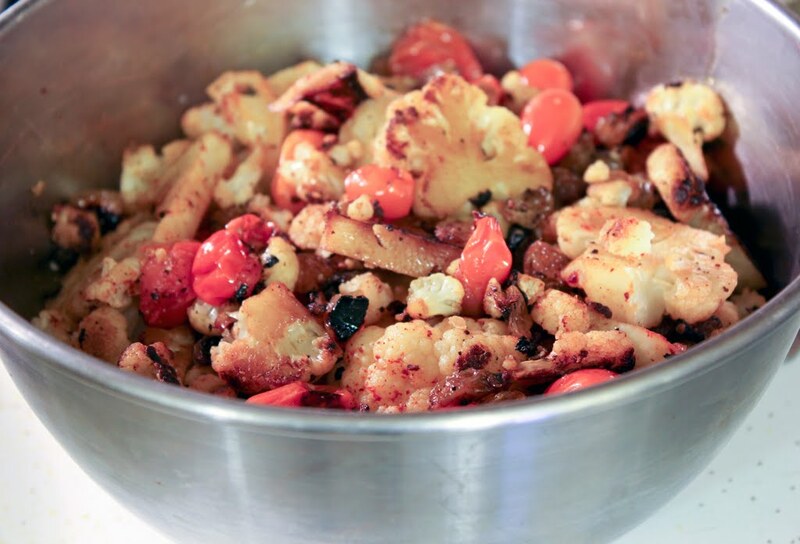 If you're doing two batches, sprinkle a little more pimentón de la vera and salt on the second round of cauliflower. You can always add more to taste afterward. 3. 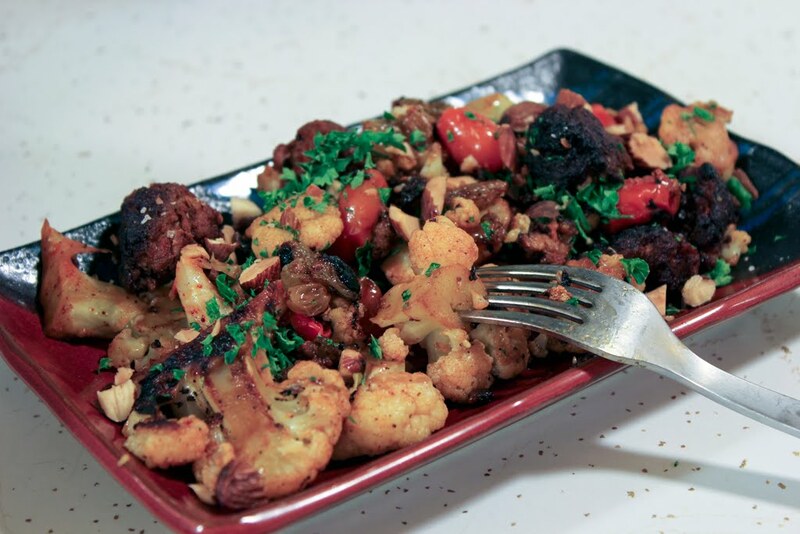 Add cauliflower to chorizo and toss to mix. Adjust seasoning to taste. If you feel the chorizo should be warmer, you can toss just it or the whole mixture back on the pan and crisp it up a bit. Serve with chopped nuts and parsley. Drizzle a little olive oil on top as well. If you live in Boston, you can go to Toro instead of making this! But, if not, have fun cooking!